Conservation provisions of multiple Farm Bills have had a significant impact on restoration and enhancement of wildlife habitat in the Mississippi Alluvial Valley (MAV). Through highly effective programs such as the Wetland Reserve Program, Wildlife Habitat Incentives Program and Environmental Quality Incentives Program, Ducks Unlimited partnered with the Natural Resources Conservation Service (NRCS) to restore thousands of acres of waterfowl habitat throughout the MAV. However, as the conservation community evaluates the quantity and quality of wildlife habitat available in the MAV, significant needs and opportunities exist to further advance the integration of habitat development on working lands. 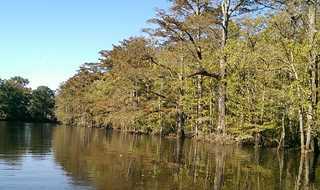 Through a recently approved NRCS Regional Conservation Partnership Program (RCPP) project, DU will work with farmers in Louisiana to combine applicable Farm Bill programs with restoration of degraded cypress-tupelo brakes. This unique, whole-farm strategy will utilize these restored wetlands as storage reservoirs to improve water quality and increase irrigation efficiency. Restoration of these wetlands, coupled with improving water delivery infrastructure, will also enhance capabilities to flood agricultural fields in winter for waterfowl and shorebirds, improving wildlife habitat and reducing groundwater extraction. The hydrological restoration of brakes on working agricultural lands within the MAV to capture surface water and storm runoff from fields is an innovative practice to improve water quality, conserve and utilize water resources, and improve habitat for wildlife while reducing input costs from pumping groundwater from the substantially declining alluvial aquifer. Storm water is collected through tailwater recovery ditches, which allow sediment and nutrients to settle to the bottom prior to the water being moved into cypress-tupelo brakes where it is stored until needed. This project includes Catahoula, Concordia, East Carroll, Franklin, Morehouse, Richland, and Tensas parishes. Partners anticipate initial sign-up opening early in 2019.